At Pink Weddings we are always looking for innovative products and ideas to enhance your day and to make them more memorable. Pink Weddings are pleased to offer a great range of innovative, patented glow in the dark products bringing the WOW factor to your day or evening reception. go on WOW them. 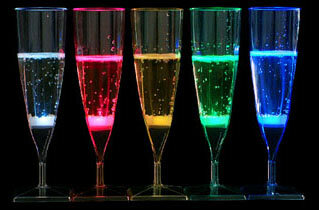 The Glow Champagne Flutes and tumblers will light up your day and surprise your guests; the luminous champagne fountain can also add a magical effect. 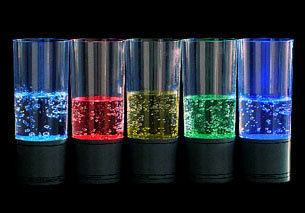 The new Glow Shot Glass: A patented plastic shot glass, which lights up when you fill it with liquid. 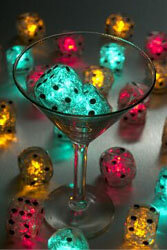 When the Shot Glass is emptied, the light goes out. Give your day a real Buzz with these brilliant New Cocktail Glasses. The Glass operates simply by pushing a switch on the base of the glass. There are various shapes available to suit your requirements. 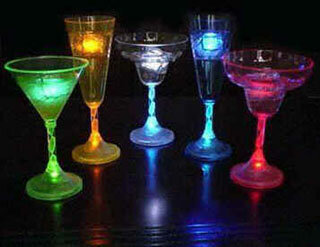 Each Glass is supplied with replaceable batteries, ensuring a bright glow all evening! A New unique design of Ice Cubes. 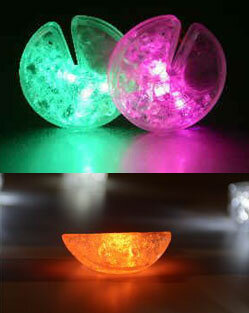 A fruit slice which can simply clip over the edge of the glass for a brilliant glow to your cocktail or any type of drink. Another innovative shape available is a fruit slice to be placed in the drink. 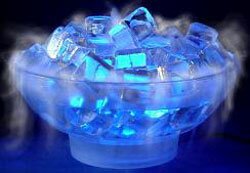 The Ice Bowl Mist Maker floats mist over the side filtering slowly through the gently glowing ice cubes. 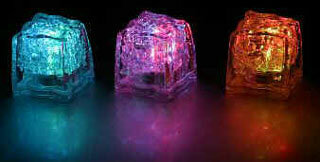 The Unit comes complete with bowl, sequenced waterproof lighting unit, glass cubes and 240V power supply. Could be your chance to make a centre piece really come alive. 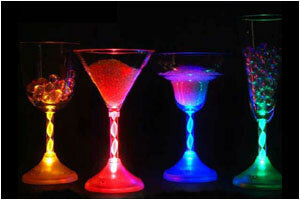 These fantastic New Glow Cocktail Stirrers light up your drink by simply twisting the end of the stirrer. They are available with various shapes on one end and you can even have your own shape custom designed! 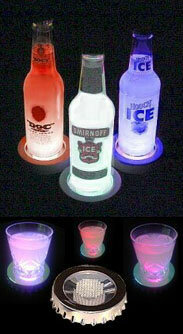 Our Glow Coaster will light up your drink or bottle when you place your drink on it. When you lift your drink, the light will go out.Batteries are inserted into the bottom of the unit by removing the battery covers. The glass is placed on the coaster on a flat surface and the three coloured LEDs emit a sequenced light, that reflects through the drink. 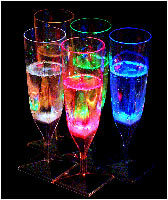 Crystal Glasses and Light coloured drinks are most effective. 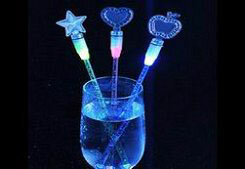 These bright straws light up and down your straw as you sip your drink. 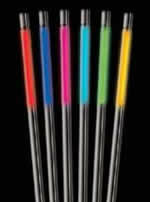 Each straw is pre-fitted with a secure Glowstick within the straw that is suitable for all ages. The glow Stick lights up throughout its length when you tap the end and stops lighting as you tap the opposite end. The light sticks glow in the dark as many times as you need until the battery is exhausted. The Glow in the dark torch lights up half its length when you tap the end and stops lighting as you tap the opposite end. The other half of the torch has a clear compartment suitable for invitations, sweets or liquid. The light sticks glow in the dark as many times as you need until the battery is exhausted. 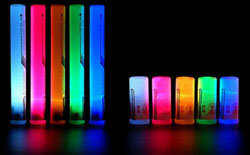 The Chemical Glow Sticks contain two different non-toxic chemicals that when mixed together, create light. There is a glass bubble inside the stick that contains one chemical and that is surrounded by another. When a glow stick is bent slightly, the glass bubble is snapped and the two chemicals mix together to produce light.